designboston: Design blog based in Boston, featuring news and information about architecture, interior design, product design, and green design from around the city and beyond.designboston: Drawing Pod at Pecha Kucha TONIGHT! 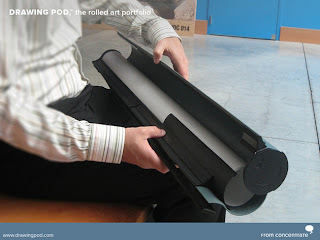 Some last minute news on a great event: From Concentrate's David Oliver will be presenting his Drawing Pod (which I've written about previously) tonight at Pecha Kucha. Pecha Kucha is a worldwide series of events for architects, designers and technologists. "Each presenter is allowed 20 images, each shown for 20 seconds each - giving 6 minutes 40 seconds of fame before the next presenter is up. This keeps presentations concise, the interest level up, and gives more people the chance to show." Pecha Kucha Boston is hosted by the Harvard Graduate School of Design. The event is free and open to the public. Unfortunately, I'm a bit under the weather, so I won't be making it.